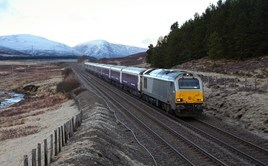 New destinations for Scottish sleeper trains? Oban and Scotland’s Far North could be served by Caledonian Sleeper trains, but funding from authorities would be needed to support the services. CS Managing Director Peter Strachan, speaking exclusively to RAIL on May 6, confirmed that discussions had taken place with user groups regarding running trains north of Inverness, and with business groups for Oban. If the latter happens, he has not ruled out the possibility that extra Mk 5 coaches may have to be ordered from Construcciones Y Auxiliar De Ferrocarriles (CAF). The Spanish company is already building 75 vehicles for CS that will enter traffic in 2018. Regarding operations, Strachan said that the level of detail had not been looked at, but that he didn’t want to “tie up locomotives and stock that would otherwise be undergoing maintenance”. For more of Peter Strachan's interview, read RAIL 801, published on May 25. They can't put any more coaches on the Fort William train out of Euston. It's got 16 on now so it's full platform length. Any more and it would block access to other platforms. FrankH, could it split off Glasgow service? Is London - Oban direct only option? Or perhaps Fort William/Oban combined service and separate Inverness/Aberdeen service, along with later Glasgow/Edinburgh service? The 2116 ex Euston splits at Edinburgh for Inverness/Aberdeen and Fort William (arr 09.55) via Glasgow Queen Street High Level. It is possible to go from Glasgow Central via Exhibition Center/Dalmarnock and onto the Oban/Fort William line. Run both portions together to Crianlarich and split there. Big problem being you'd need an extra pair of 73's if they persist on top and tail . This is really good news except for one vital item apparently being overlooked. How many of our readers recall the Night Star rolling stock actually built for overnight services from Edinburgh to Paris? I wondered if good and prudent housekeeping could prevail and get these coaches demothballed if ever such a word exists and brought back from storage? The one thing that sticks in my fading memory was the gross weight of each coach. Deemed at a crucial moment to be too heavy? Another lost opportunity? Certainly a lost opportunity but I don't believe these coaches are mothballed; they are running happily (modified for northern winters) for VIA Rail Canada. And '73s certainly couldn't cope with the weight of these coaches...would Oban, Ft. William or Far North even cope with the weight? New Sleeper stock is being built by CAF just now, leagues ahead of the Mk3s, and a lot lighter than the Nightstars.